Pittsburgh University earned the top seed in the Division I bracket of the 2014 US Lacrosse Women’s Collegiate Lacrosse Associates (WCLA) National Championships, presented by Harrow Sports, while University of North Carolina Club earned the No. 1 seed in the Division II bracket. The event, featuring the top women’s collegiate club teams in the country, takes place May 7-10 at the Princess Anne Athletic Complex & Stadium in Virginia Beach, Va. The Division I bracket includes 16 teams while the Division II bracket has 12 teams. Both tournament fields are comprised of a combination of teams earning automatic qualifiers as league champions and teams earning at-large berths. Division I and II seeds are listed below. Pittsburgh brings a 17-1 overall record and nine-game winning streak into the WCLA championship tournament, including a 14-12 win last weekend over Ohio State Club in the championship game of the Women’s Collegiate Lacrosse League (WCLL) tournament. The Panthers were WCLA national quarterfinalists last year and are making their ninth overall appearance in the US Lacrosse WCLA National Championship. Defending Division I national champion Colorado State, which has won the national title four times, is seeded seventh and is making its 11th consecutive appearance in the championship. The Rams beat UC Santa Barbara 14-4 in last year’s national championship game. In the Division II bracket, University of North Carolina Club earned the top seed and brings an unblemished 11-0 overall record into the WCLA National Championship. The Tar Heels won the Mid Atlantic Women’s Lacrosse League (MAWLL) Division II title last week with a 15-14 overtime win over James Madison University Club, last year’s Division II national champion. James Madison is the number two seed in this year’s championship. COVER STORY – Worth the Wait They’ve toiled for years in pursuit of the opportunity that lay before them now – to represent their country on home soil. 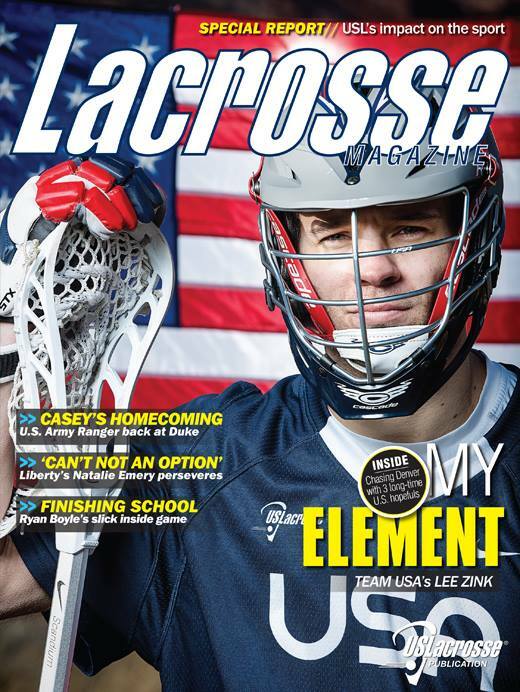 With the FIL World Championship just three months away, LM profiles three U.S. Team hopefuls on destiny’s doorstep- Lee Zink, Kevin Leveille and Chris Eck. FEATURES Casey’s Homecoming After four deployments as a U.S. Army Ranger, 29-year-old defenseman Casey Carroll feels lucky to be a Duke Blue Devil again. by Corey McLaughlin | Online Extra – “Tuesday’s With Corey” column on Carroll from earlier this spring. “I’m Kind of Unique” An injury at birth left Liberty’s Natalie Emery with limited use of her right arm, an obstacle the powerhouse lefty and Tennessee native now considers a gift. By Laurel Pfahler First Stick in Key West Not everyone in the Florida Keys is on vacation. Devoid of lacrosse in the southernmost point of the continental U.S., a few transplants used the US Lacrosse First Stick Program to get the sport off the ground. By Paul Ohanion COLUMNS From the Editor: Sports and Geopolitics His Space: Legend and Spirit Honored Her Space: For the Love of Lacrosse Boyle Point: The Trouble With Labels DEPARTMENTS High School Rundown Gaze on the early-season stars from the South and marquee games that could cause tectonic shifts in the Nike/US Lacrosse National Top 25 polls. The Scoop The Army-Navy rivalry comes to women’s lacrosse, the MLL and LXM Pro Tour play nice and former Princeton star Sean Hartofilis breaks into the movie business. World Lacrosse 2014 Navy’s Old Goats will be out in full force for the World Festivals in Denver. Your Edge Former Florida star and current Team USA midfielder Brittany Dashiell gives her tips for play between the lines. Give and Go Team USA assistant and Penn State University head coach Jeff Tambroni is on the hot seat this month. What did the former Hobart midfielder have to say to our questions? 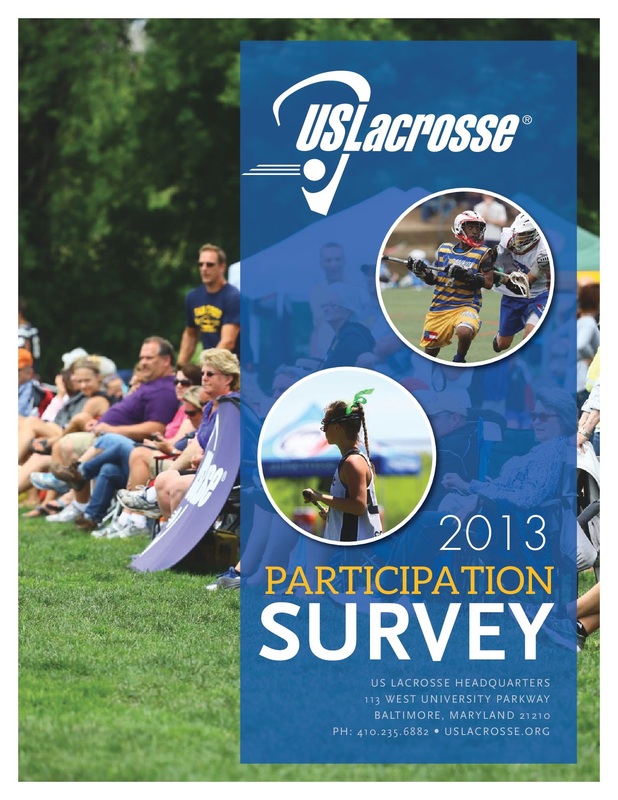 US Lacrosse today announced the final rule revisions for the 2014 girls’ high school and youth lacrosse rules. Both sets of rules are endorsed by the National Federation of State High School Associations (NFHS) and written by the US Lacrosse Women’s Game Rules Subcommittee and approved by its Women’s Game Committee. 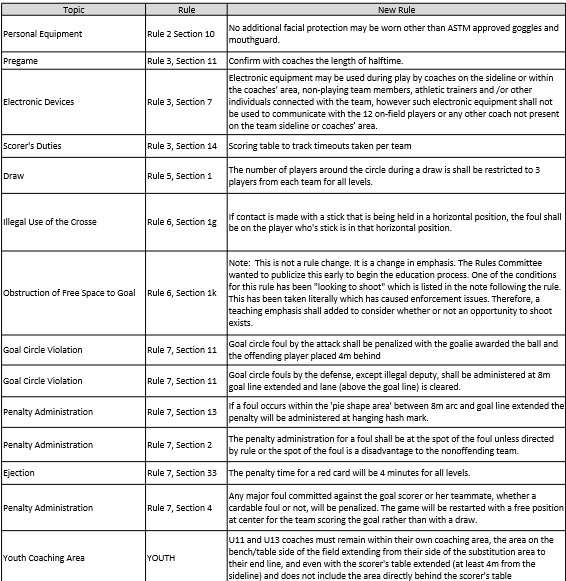 The youth rules are a product of modifications to the high school rules. The points of emphasis for the 2013-2014 season are strict enforcement of rules governing illegal: body contact, obstruction of free space to goal, repetitive fouls, and stick contact and cross checking. disallowing additional facial protection to be worn other than ASTM International-approved goggles and mouth guard. ASTM International Women’s Lacrosse approved goggles have been the standard since the rule was created in 2004.